Working in the hurricane shelters after Camille, I found the clinical experience to be not very dramatic. Hurricane shelter medical practice was like busy general practice. Minor conditions, such as fire ant bites and skin infections, prevailed. As the days passed, there were fairly rapid changes in the assortment of conditions treated. Were these changes part of predictable trends? We expected epidemics, but with the work divided between many volunteer physicians and nurses, we weren’t sure that we could even detect an epidemic early enough to take action. Donations of medical supplies were often inappropriate. Physicians’ samples, though welcomed, presented problems of sorting, storage and outdated drugs. Donated hearing aid batteries far exceeded needs. Shoes were ill-fitting, often because donors forgot to tie them together in pairs. During the first month after the storm, refugees on the West Bank of Plaquemines Parish accumulated nearly 30,000 person-days of exposure to the peculiar risks of life in the hurricane shelters. Professional volunteers rapidly decreased in number as the days passed, and public health personnel took over most of the duties. There were 6 racially segregated shelters, (5 high schools and, briefly, a US Naval Air Station) which served 4 relatively distinct populations. Three of the shelters were located in the northern part of the Parish, in Belle Chasse (just south of New Orleans). A fourth opened 3 days after the storm, in Port Sulphur. After flood waters had receded and utilities were restored, 2 weeks after the storm, all of the refugees were transported to the 5th and 6th shelters, in Buras, 50 miles south of Belle Chasse. “…Plaquemines Parish, Louisiana [is] a racial and ethnic gumbo in the swamps ruled for over 60 years by the all-powerful Perez family. From the time Judge Leander Perez came to power in 1919, he made headlines across Louisiana and throughout the country. The Judge and his two sons clamped down on all political opposition, restricted free elections, disenfranchised black citizens, and made millions of dollars from oil. In the 50s and 60s Judge Perez became a national spokesman for racial segregation, bankrolling George Wallace and going so far as to outfit an old Civil War fort as a high security prison for any civil rights demonstrators who dared to venture into his county. 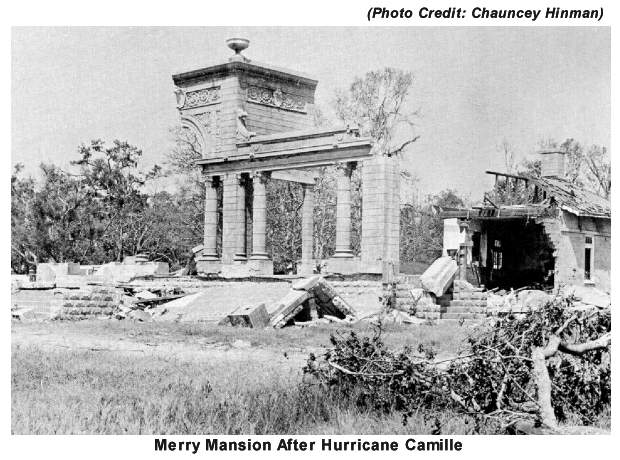 Camille was no respecter of status, and the Sheriff and members of the Parish Council were among those whose homes were destroyed.